World record holder Paul Tergat insists he is chasing the Flora London Marathon title and not his own record when he contests the race on Sunday. The Kenyan set the world mark of two hours four minutes and 55 seconds in Berlin two years ago but has now set his sights on a first London title. 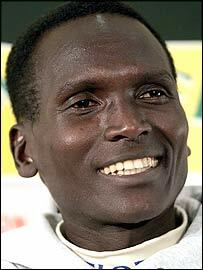 "I'm here to do the best I can and to try and win London if all goes well," Tergat told BBC Sport. "I'm not talking about times but if it comes then I will be celebrating." Tergat has twice finished as runner-up in London, on his debut over the distance in 2001 and again in 2002.
Who will win the London race? The 35-year-old will line up against a high-class field which includes Olympic champion Stefano Baldini, world champion Jaoud Gharib and defending champion Evans Rutto. Tergat goes into the race as 5-2 favourite but the experienced long distance runner believes the odds are stacked against him. "I don't want to underrate anyone," warned Tergat. "I know we have a strong race and there are great runners here. "Everyone is going to fight to win this race, no-one is going to let this go easily. "And even before we talk of who is going to win we need to look at all sorts of factors in terms of the weather, the pacemakers and the course." Organisers have quickened the course by about 40 seconds which should help Tergat, who favours a quick sprint to the line. But the Kenyan, who has won five straight world cross country titles, is not taking anything for granted after his experience at the Olympics where he faded badly and finished in 10th place. Tergat suffered stomach cramps after failing to take on board his pre-prepared drinks in the closing stages of the race. "I want to get what happened in Athens behind me completely," said Tergat. "It was a big disappointment for me so now I'm looking forward to the race and staying really focused. "If I win the 25th London Marathon that would be nice but I'm just keeping my fingers crossed that I can give my best as usual."